Excel dashboard training is an eBook and example templates with detailed instructions on how to build powerful business reports in Excel using dashboard visualization. The dashboard structures are designed for professional printed publications as well as management reporting for conveying information at a glance for optimized decision making. 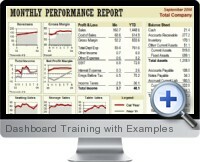 A variety of techniques covered including color use, mini charts and summary tables facilitate fast updating of data to prebuilt dashboards and reporting that quickly understood by end users. Information explaining the advantages of dashboard reporting with case study examples on how they can add value to reporting processes. Instructions on how to quickly and successfully create mini charts that are highly effective for reporting. Explanations of various data visualization components including charts and gauges and when each should be used in Excel dashboard reports for the best communication purposes. Techniques to combine cell data and multiple chart series for effective trend comparison and performance reporting. Tips and advice for using the camera tool in Excel for effectively attaching relevant table data to dashboard visualizations with matching layout. Best practices for data manipulation and data funneling via database connectivity, pivot functionality and reference functions so that the dashboard reporting is easy to maintain and update. The use of Excel data objects and how their inbuilt functionality can be leveraged for reliable and fast reporting solutions. Detailed step by step guides for building dashboard reports in Excel by employing the best components and combinations of them to convey information in the most efficient and effective manner. The use of colors and styles to make reports suitable for professional print publications and external media. More than 20 Excel dashboard examples with dummy data covering all of the topics in the eBook training to quickly accelerate learning and creation of new dashboards. Works with all versions of Excel for both Windows and Mac.